Acute spondylolisthesis symptoms can be linked to worsening structural issues, traumatic injury or idiopathic reasons. There is no definitive way to be certain of why pain might flare-up acutely in spondylolisthesis, but some explanations can be identified given proper diagnostic processing. Acute presentations of back pain are always terrifying for the patient and cause for concern for care providers. Clinical medicine has rated severe lumbar dorsalgia as the single most agonizing experience a person can suffer, using traditional pain scales. There is no doubt that an acute listhesis presentation can impart significant psychoemotional trauma, in addition to the dramatic and functionally-limiting physical symptoms that it might create. This essay examines the causes and consequences of acute listhesis expressions, primarily in the lower back. We will discuss why flare-ups of pain might not always be linked to any structural changes in the spine. Acute lower back pain is a diabolical set of symptoms that often includes regional expressions in the buttocks and legs, as well. Meanwhile when listhesis affects the cervical spine, pain might exist in the neck, but also in the shoulders, upper back and arms. 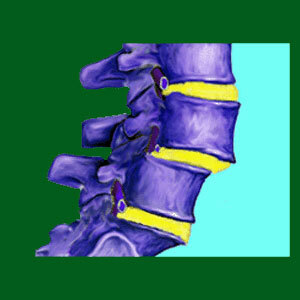 Acute spondylolisthesis symptoms might begin suddenly and for a variety of reasons. Sometimes, the patient is aware of what causes the pain to worsen, while other times the circumstances are mysterious and unexplained. Regardless, acute pain can escalate quickly, often forcing the patient into bed to wait out the worst of the suffering. Even if they do not completely immerse themselves in bed rest, most patients will be physically limited to a large degree, as well as emotionally troubled by the flare-up of suffering. Statistically, acute listhesis symptoms are linked to movement in most patients, with many citing exacerbated pain when rising from a reclining position or standing from a seated position. Activities that utilize the lower back muscles and legs often worsen the lumbar expressions, while activities that utilize the neck and arms usually worsen cervical expressions. The vertebra can potentially slip farther, possibly influencing a nerve or the spinal cord in negative ways. Sudden noticeable slippage is most often attributed to injury, but could potentially also occur from degenerative changes in less common circumstances. Muscle injury or strain might create changes in the way the spine is supported, escalating listhesis symptoms temporarily. This is very commonly reported when the patient performs physical labor to which their body is unaccustomed to, such as snow removal or gardening. Some listhesis conditions will involve escalating degrees of fracture in the pars interarticularis, which can be painful unto themselves, especially when they first occur. In the aforementioned cases where acute discomfort is incorrectly attributed to listhesis, the realm of possible causes for sharp, sudden pain increases dramatically. If some other unidentified structural issue is responsible, similar causations to those listed above might also influence this true source of symptoms, causing it to worsen. However, many, many cases of back pain that is blamed on incidental listhesis may become acute as a defense mechanism to repressed or suppressed psychoemotional issues. This is the action of causation detailed by Dr. John E. Sarno in his work with tension myositis patients. The mind can create or cure pain and in cases of idiopathic escalation, many enlightened care providers immediately look to emotional instigators and not physical changes in the spinal anatomy. We find that many flare-ups of pain are certainly the direct results of mindbody interactions and do not entail any actual alteration in listhesis anatomy or worsening of the clinical presentation of the condition as a whole. When patients understand this fact, the pain will usually resolve much quicker and more completely than when pain is attributed to mistaken structural theories of causation. This is statistically proven.